Alfred's Pop Percussion Ensemble Series has added this new arrangement, written especially for the developing intermediate and advanced percussion ensemble. 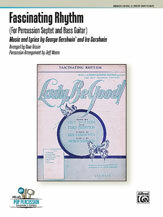 A George Gershwin favorite, Fascinating Rhythm has been scored to feature the vibraphone and drumset. Setting the familiar Gershwin melody in "7," this arrangement is based on Dave Grusin's version that featured Gary Burton on vibes and Dave Weckl on drums.